Showcase of Aussie Products like the name implies showcases genuine Aussie-made and/or produced products to the world. 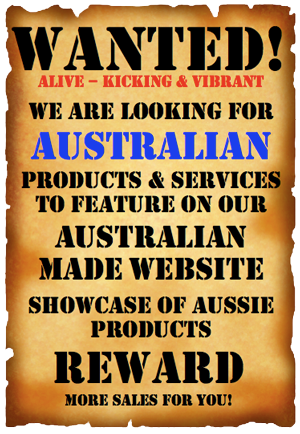 Showcase of Aussie Products was launched in September 2014, initially as a marketing exercise, to prove that a company could gain better market penetration if their product/s were grouped with other products with a common theme (in this case “Genuine Australian-made”) rather than as a stand-alone website. It has evolved to what it is today, with thousands of products in a wide range of product groups, recording over 1.9 million page views and is constantly growing. Around the world, Australia is recognised for its quality products. The world knows that buying products that have been made or grown in Australia ensures that the products are safe, fresh and made to Australia’s exacting standards. Showcase of Aussie Products have taken “Piggy Back” Marketing [Low cost market entry strategy in which two or more firms represent one another’s complementary products in their respective markets] to a new level with more businesses and a wider product selection. Using the world’s love of Australian-made products as the common theme we have built this website to promote genuine Aussie-made products to the world – building brand awareness and sales. Using up-to-date Search Engine Optimisation (SEO) & Authoritive Content techniques we list your products. We will rewrite (where necessary) your product descriptions to gain maximum searchability at no additional cost. We will regularly review these as Google guidelines change to ensure your products get maximum exposure and make them more readily found by your potential customer and improve your products’ inquiry rate. We will regularly promote your products via Social Media. Attracted to the site through good SEO, Australia’s reputation for producing quality Australian-made products encourages the average viewer (viewers from all over the world), to search further through the site with viewers, averaging over 11 products views per session, most unrelated to their initial search. We will list each of your products in its relevant category. If we don’t have a relevant category … we will create one. If a product is relevant in multiply categories, it will be listed in each relevant category. There is NO LIMIT to the number of products you can list. Your business can be listed as either RETAIL, WHOLESALE, do CUSTOM-MADE …. or all three. Many of our existing listed businesses have found that their Showcase of Aussie Products listing has found new markets and new market segments. Directed to the site by the various search engines the potential customer views the product and if they are interested in purchasing ‘click thru’ to your website. Realising that they are on a site that only shows genuine Aussie-made products they will search through either the ‘SEARCH’ box or via ‘CATEGORIES’ to find other product/s they are interested in. Our research has shown that once they are on the Showcase of Aussie Products website they, on average, view 11 products and often products different to their original search. Retail Product – The potential customer clicks though to your websites’ shopping trolley to see the price and to place an order. For those businesses who do not have a shopping trolley the enquiry is directed to your ‘Contacts’ Page. Once this potential customer becomes your customer they will contact you directly for all further purchases. Note: Showcase of Aussie Products is designed to build brand awareness and introduce potential customers to your products and in most cases, this will be a one-off referral as all their future enquiries will go directly to your website. Wholesale Product – Wholesale products are identified on the product listing and via the ‘Business Opportunities’ tab. Potential resellers / wholesalers / agents / distributors are referred directly to you. Note: Showcase of Aussie Products will in addition, actively search for new resellers / wholesalers / agents / distributors via direct mail campaigns to relevant businesses throughout Australia. Custom-Made Product – The customer clicks through to your website for more information and to get a quote. Whether you sell Retail, Wholesale, do Custom-Made or all three, Showcase of Aussie Products can help you build brand awareness and market your products to a wider audience. If you don’t have a website, provide us with your businesses profile, pictures and a description of your products or services and we will list your products. Showcase of Aussie Products can be used as your landing page and de-facto website. Click here for COSTS – You can opt out at any time. See copy our Terms of Arrangement. * “Australian-made” on Showcase of Aussie Products means a product is 100% Australian made with a minimum of 85% Australian components/ingredients unless these are not available in Australia. Preference will be given to products that are 100% Australian.